Glasdegib (PF-04449913) is an experimental cancer drug developed by Pfizer. It is a small molecule inhibitor of the Sonic hedgehog pathway, which is overexpressed in many types of cancer. It inhibits smoothened receptor, as do most drug in its class. Four phase II clinical trials are in progress. One is evaluating the efficacy of glasdegib in treating myelofibrosis in patients who were unable to control the disease with ruxolitinib. Another is a combination trial of glasdenib with ARA-C, decitabine, daunorubicin, or cytarabine for the treatment of acute myeloid leukemia. The third is for the treatment of myelodysplastic syndrome and chronic myelomonocytic leukemia. The fourth administers glasdegib to patients at high risk for relapse after stem cell transplants in acute lymphoblastic or myelogenous leukemia. Glasdegib is an orally bioavailable small-molecule inhibitor of the Hedgehog (Hh) signaling pathway with potential antineoplastic activity. 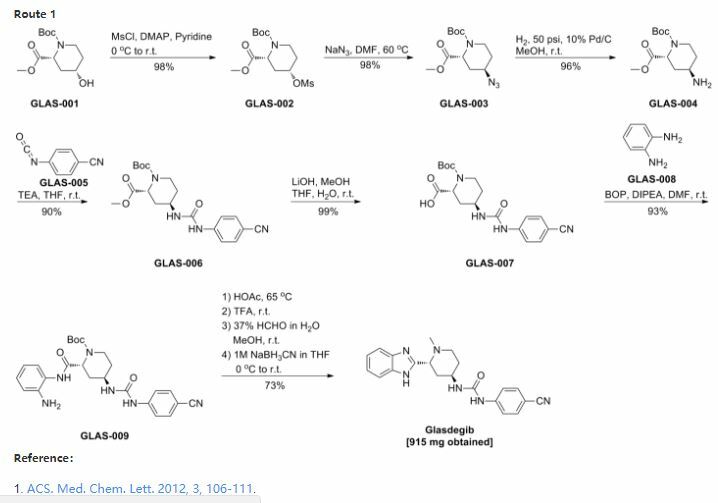 Glasdegib appears to inhibit Hh pathway signaling. The Hh signaling pathway plays an important role in cellular growth, differentiation and repair. Constitutive activation of Hh pathway signaling has been observed in various types of malignancies. Glasdegib is under investigation for the treatment of Acute Myeloid Leukemia. Product was purified by Companion (ReadySep 40g, silica gel packed) with CH3OH/CH2Cl2 from 1-5% to give the title compound as an off-white solid 915mg (73%). LC-MS 375.3. 1H NMR(acetone-D6): δ 1.81 (m, 2H), 1.9- 2.05 (m, 2H), 2.10 (m, 1H), 2.17 (s, 3H), 2.52 (m, 1H), 2.94 (m, 1H), 3.86 (m, 1H), 4.2 (m, 1H), 6.4 (d, 1H), 7.16 (m, 2H), 7.52 (m, 2H), 7.60 (m, 2H), 7.62 (m, 2H), 8.46 (s, 1H). The dihydrochloride salt was prepared by adding 4M HCl in dioxane (1.22mL, 4.86 mmol) to a solution of 1-((2R,4R)-2-(1H-benzo[d]imidazol-2-yl)-1-methylpiperidin-4-yl)-3-(4- cyanophenyl)urea (910 mg’s, 2.43mmol) in methanol (10mL). The mixture was stirred at at 230C for 10 minutes. The solution was concentrated to give a white solid, 1082 mg’s as the 2 .HCl monohydrate salt. M.P. > 125 0C with dehydration above 130 0C. Analytical calculated for free base C21H22N6O: C 67.38%, H 5.88%, N 22.46%; Found: C 67.16%, H 5.54%, N 22.18%. Purity of the dihydrochloride monohydrate salt was determined to be > 99.9% by analytical HPLC using a Xbridge C18; 3.5µm column and eluting with 95:5 0.1% Perchloric Acid (HClO4) solution in water and acetonitrile, over a gradient of 25 minutes, with and ending solvent ratio of 5:95. Enantiomeric purity of the dihydrochloride monohydrate salt was > 99.9% by chiral HPLC using a Chiralcel OJ column and eluting with 96:4 Heptane:Ethanol(with 0.1% diethylamine). 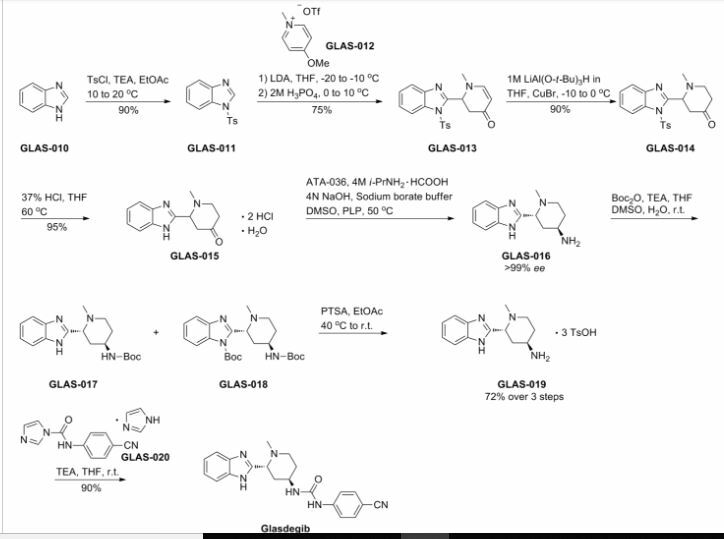 A concise, asymmetric synthesis of a smoothened receptor inhibitor (1) is described. The synthesis features an enzymatic transamination with concurrent dynamic kinetic resolution (DKR) of a 4-piperidone (4) to establish the two stereogenic centers required in a single step. This efficient reaction affords the desired anti amine (3) in >10:1 dr and >99% ee. The title compound is prepared in only five steps with 40% overall yield. 1 as white solids3 (27.1 g, 99.5 wt%, 90.0% corrected yield, > 99.0 UPLC area% purity): m.p. 223–224 °C; UPLC tR 2.11 min; 1 H NMR (DMSO-d6) δ 12.39 (s, 1H), 8.94 (s, 1H), 7.69 (m, 2 H), 7.57 (m, 3 H), 7.43 (m, 1 H), 7.13 (m, 2H), 6.75 (d, J = 7.2 Hz, 1H), 4.08 (m, 1H), 3.63 (dd, J = 10.3, 3.5 Hz, 1H), 2.89 (dt, J = 12.0, 4.0 Hz, 1H), 2.40 (td, J = 11.9, 3.1 Hz, 1H), 2.06 (s, 3H), 1.98–2.10 (m, 1H), 1.83–1.95 (m, 2H), 1.72 (m, 1H); 13C NMR (DMSO-d6) δ 155.7, 153.9, 144.8, 142.7, 134.3, 133.2, 121.8, 120.9, 119.4, 118.5, 117.3, 111.2, 102.4, 58.6, 49.9, 43.7, 42.4, 36.0, 29.8. HRMS (EI) calcd. for C21H23N6O [M+H]+ : 375.1928; Found 375.1932. To the crude solution of 3 in DMSO-H2O (UPLC assay ~55.0 mg/mL, 104 mL, ~5.74 g of 3, 24.9 mmol) from the enzymatic transamination reaction (vide supra) was added THF (57.0 mL) followed by 17 (mixture with imidazole, 9.31 gm, 74.0 wt%, 31.2 mmol). The mixture was then stirred at rt for three hours. Once the reaction was complete (<1 % of 3 remaining by UPLC), methanol (10.1 mL, 249 mmol) was added followed by 2-MeTHF (57.0 mL). The layers were separated and the aqueous was extracted with 2-MeTHF (57.0 mL). The combined organic layers were then washed with 2 × 50.0 mL water and 2 × 50.0 mL of 10% aqueous NaCl solution. The organic solution was then concentrated under vacuum and the solvent was switched to acetonitrile to give a slurry with a final volume of ~90.0 mL. The slurry was stirred at rt for three hours and filtered, and the solids were washed with 2 × 10.0 mL of acetonitrile and dried in oven at 60 °C for two hours. The solids (~7.90 gm) were then slurried in 70.0 mL of acetonitrile. The slurry was heated to 60 °C for two hours, cooled to rt, filtered, and the solids were dried in oven under vacuum at 60 °C for 12 hours to give 1 as white solids (7.64 g, 98.0 wt%, 80.0% corrected yield, > 98 UPLC area% purity). The analytical data were identical to that obtained with method A. 1. Lin TL, Matsui W. Hedgehog pathway as a drug target: smoothened inhibitors in development. Onco Targets Ther. 2012;5:47-58. 2. Munchhof MJ, Li Q, Shavnya A, et al. Discovery of PF-04449913, a potent and orally bioavailable inhibitor of smoothened. ACS Med Chem Lett. 2012;3(2):106-111. 3. Clement V, Sanchez P, de Tribolet N, et al. Hedgehog-GLI1 signaling regulates human glioma growth, cancer stem cell self-renewal, and tumorigenicity. Curr Biol. 2007;17(2):165-172. 4. Deschler, B. and Lübbert, M. (2006), Acute myeloid leukemia: Epidemiology and etiology. Cancer, 107: 2099–2107. doi: 10.1002/cncr.22233. 5. American Cancer Society. Key statistics for acute myeloid leukemia. Available at https://www.cancer.org/cancer/acute-myeloid-leukemia/about/key-statistics.html. Accessed January 25, 2018. 6. SEER Cancer Stat Facts: Acute Myeloid Leukemia. National Cancer Institute. Bethesda, MD, April 2017. Available at: http://seer.cancer.gov/statfacts/html/amyl.html. Accessed January 25, 2018. 7. Appelbaum FR, Gundacker H, Head DR, et al. Age and acute myeloid leukemia. Blood 2006; 107(9): 3481-5. 8. Estey E. Acute myeloid leukemia and myelodysplastic syndromes in older patients. Journal of Clinical Oncology: Official Journal of the American Society of Clinical Oncology 2007; 25(14): 1908-15. 9. Kantarjian HM, Thomas XG, Dmoszynska A, et al. Multicenter, randomized, open-label, phase III trial of decitabine versus patient choice, with physician advice, of either supportive care or low-dose cytarabine for the treatment of older patients with newly diagnosed acute myeloid leukemia. Journal of Clinical Oncology: Official Journal of the American Society of Clinical Oncology 2012; 30(21): 2670-7. 10. Ornstein MC, Mukherjee S, Sekeres MA. More is better: combination therapies for myelodysplastic syndromes. Best Pract Res Clin Haematol. 2015;28(1):22-31. Jump up^ “Glasdegib – AdisInsight”. Adisinsight.springer.com. Retrieved 2017-05-22. Jump up^ “Single-Agent Glasdegib In Patients With Myelofibrosis Previously Treated With Ruxolitinib – Full Text View”. ClinicalTrials.gov. Retrieved 2017-05-22. Jump up^ “A Study To Evaluate PF-04449913 With Chemotherapy In Patients With Acute Myeloid Leukemia or Myelodysplastic Syndrome – Full Text View”. ClinicalTrials.gov. Retrieved 2017-05-22. Jump up^ “Phase II Hedgehog Inhibitor for Myelodysplastic Syndrome (MDS) – Full Text View”. ClinicalTrials.gov. Retrieved 2017-05-22. Jump up^ “PF-04449913 For Patients With Acute Myeloid Leukemia at High Risk of Relapse After Donor Stem Cell Transplant – Full Text View”. ClinicalTrials.gov. Retrieved 2017-05-22.